Body Language For Dummies is your ideal guide tounderstanding other people, and helping them understand you. Bodylanguage is a critical component of good communication, and oftenconveys a bigger message than the words you say. This book teachesyou how to interpret what people really mean by observingtheir posture, gestures, eye movements, and more, and holds up amirror to give you a clear idea of how you're being interpretedyourself. This updated third edition includes new coverage ofvirtual meetings, multicultural outsourcing environments, devices,and boardroom behaviours for women, as well as insight into Harvardprofessor Amy Cuddy's research into how body language affectstestosterone and cortisol, as published in the Harvard BusinessReview.. Body language is a fascinating topic that reveals how the humanmind works. Image and presentation are crucial to successfulcommunication, both in business and in your personal life. Thisbook is your guide to decoding body language, and adjusting yourown habits to improve your interactions with others. Realising what kind of impression you give is a valuable thing,and learning how to make a more positive impact is an incrediblyuseful skill. 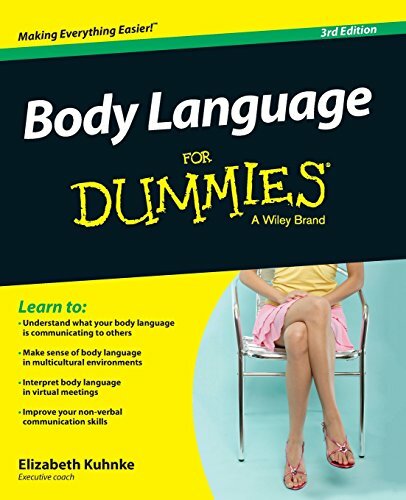 Whether you want to improve your prospects in jobseeking, dating, or climbing the corporate ladder, Body LanguageFor Dummies helps you translate the unspoken and get yourmessage across.